I kind of went through this on another post, but think this is the better place for it. First of all, I just got a new liner in last week and after I got it filled and turned on the pump, I noticed that the skimmer was leaking on the outside when the pump was on, but wouldn't leak when it was off. The pool guy was just here and the news isn't good. He looked at the skimmer and noticed that the opening was cut with tin shears, bent down to get the skimmer in and then bent back up. It wasn't a factory cutout for the skimmer. It looks like a jerry rig job. I just got the house last year, so I don't know who put it in. He said that he doesn't think that wall is safe because of the cuts and that the cuts aren't clean. He's afraid that the wall could give out and possibly injure somebody. He's going to call around to get opinions to see if he could patch that wall and move the equipment. This will obviously cause the pool to be drained and the liner shifted. He feels comfortable that he could get the holes to line up. Also, will I have to pay for the liner to be moved again? I realize that I will have to pay for the patch to the wall if he's able to do it and the water. Yikes! I can't picture the skimmer cutout compromising the structural integrity of the pool. Is it easy to post a pic to discuss? Others who know AG's a lot better than me will be along shortly with a better opinion. AGP skimmers sit outside the pool and the front plate and gasket(s) go inside the pool. I can't imagine why they would need to cut the skimmer hole and bend it down to get the skimmer through. He doesn't think it was the original skimmer and he's worried the cuts would tear out. Is that the liner you can see through the crack at the bottom? It looks like duct tape. One guy said there wAs a lot of duct tape when the took the old liner out. Umm that is not duct tape I see. That is the pool wall bent out and the skimmer box attached right to the liner IMHO. Can't say that I have seen that before. 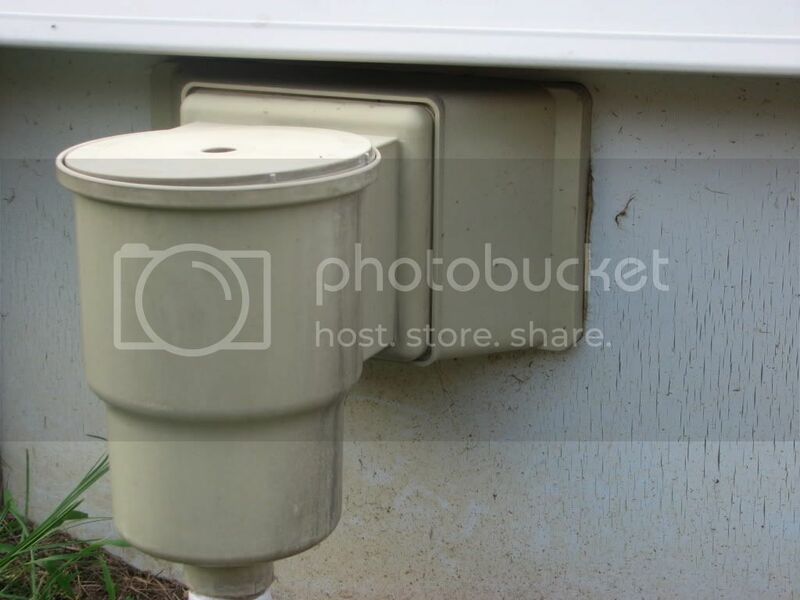 To the best of my knowledge the skimmer box should sit on the outside of the steel wall with a gasket between it and the inner part of the skimmer plate (which is inside the pool) with the vinyl liner sandwiched in between. Looks like this one was poked through the wall and the steel wall attached to the backside of the skimmer box. Is your skimmer box a widemouth version? If it is not you might be able to swap to that version and move the box to the outside of the wall like it should be. The hole in the steel wall would need to be cut some and cleaned up then use some new gaskets and attach it correctly to the pool and liner and it might work out. You would need to drain some water out but not all. It looks attached to the wall with those screws so it didn't put pressure on the liner. I don't think it's a wide mouth, how would that fix the parts underneath the skimmer. The frame around the top looked cut as well. Thanks for the advice, I want it to be safe but I didn't plan for any added expenses with the liner replacement. Never mind the above post. I didn't have my mind around what you were saying until I reread it again. Makes a lot more sense now. Yes that picture describes what I am talking about. In essence the widemouth skimmer will require you to cut a larger hole for the skimmer thus getting rid of the jagged edges and poor install. Then you can install the skimmer box correctly. I really think this is worth trying as it should solver your problem and give you a nice tight fit from the skimmer to the liner -- the proper way. The key is to cut the wall & liner cleanly and to the right size and that should clean up the crappy edges you have now. Not sure what would be the best way to cut the wall safely but it should be doable. Take your time and be patient. Plus if this works no moving of the liner, no drain and refill and no patching to the wall needed. And just to cover me -- try this at your own risk as I am no expert or pro and have not done this before. I do something similar to an Intex metal frame pool but that had no steel wall to mess with so it wasn't that bad. That sounds great. I'll bring it up to the pool guy and see if he'll do it. I've never done that before so I don't want to ruin my new liner. This site is a great place to get a "second opinion" without having to call another pool store. At least they haven't tried to sell me chems yet. This guy does seem to be looking out for my best interest and not trying to make a buck. He might not have thought of this. If I end up having to do this I could use my dremmel to make the cuts so I don't have to try to stick the tin snips in there without poking a hole in the liner before I'm ready. Actually yes your dremel would probably be a good way to go. Might I suggest you drop the liner down in this corner if possible and then I would definitely put a board or something on the inside of the pool to "block" the opening and protect the liner. I would either have someone hold it there or tape it in place or something. This means you probably want to drop your water level several inches below the bottom of the skimmer to give yourself plenty of room to work. The key is to make sure your new opening fits the template for the new skimmer box and by doing it this way you are in essence "cutting out" what was done wrong. It will be tricky doing this the liner in place but it should be possible. I just measured what it would take to clean up the hole and it might be real close. I would have to cut the whole to 7"x11". I looked in a pool catalog and the outer dimensions are 8 3/8" x 14 1/2". The inner dimensions are 5 7/8" x 11 1/2". I also would have a space of about 2" above the skimmer. You can see in the second pic above where the top frame is cut out for the skimmer. Yes I see that (about the frame) and that tells me the install was done even more wrong because you should never cut the frame. My guess is that they wanted the skimmer as high up as possible providing for as much water depth as possible. Skimmer boxes don't go to the very top into the frame they are below it. Your dimensions as you said are close. It may still be doable but as they say measure twice, cut once. It's up to you but I think this is your only alternative outside of what you mentioned and that is a full drain, move/reinstall the liner, patch the old spot and cut a new one (mounting the box correctly). What makes this the most frustrating is that this is a brand new liner and it wasn't noticed until after the liner was installed. I know it's not really the liner installers fault, since their work is done on the inside of the pool. If I had known, I would have probably waited and put in a new pool, now it seems like I might be out the cost of the liner and installation. Also, I'll be out if I have to get it fixed. On top of that I'll probably still have to get a new pool next year, where the new liner probably won't fit. About the only positive news is that I would save money on the pump and filter. I don't think your liner is hosed. If you have to pull it yes it my be difficult to get it to line back up if it is an overlap style. If it is beaded it will still be difficult but more doable IMHO. If you were planning to replace the pool next year can you live with the leak for the rest of the season ... ie is it that bad? I still can't believe that the liner people let that pass. It seems to me that the liner would be buldging into the hole if it's the liner we're seeing in the crack in the pic. If you press in on the liner near the skimmer does it feel like there's a solid backing behind it? I wasn't planning on replacing it, but it seems I might not have a choice if we can't get it fixed and fixed right. It does seem to come out at a pretty good clip after it's been running a while, so I don't know if I'd be able to make it running overnight. Bama, I'll have to try that when I get home. I have to agree with you though. One of the guys that was out there, said something about a lot of duct tape, but I didn't catch onto it. He seemed like he was college age. I'm getting the feeling that the main guy who has about 14 yrs of experience only comes out to cut in the skimmer and return and leaves the manual part to the youngins.